Many times as furniture makers, we will put a finish on the underside of a tabletop to prevent it from warping or cupping. The theory being, if you put the same finish on the top as you do the bottom the moisture transfer will be equalized on all sides, helping to prevent wood movement. Regardless whether or not this theory is true, there are other reasons to finish the bottom of your tabletop. I am often asked to match a stain color and in doing so I end up mixing different colors together in an attempt to get the color just right. The underside of the tabletop gives me a blank canvas and plenty of room to dial in the color. This also adds extra reassurance that the stain will react the same on the top as it did on the bottom because I am staining the same piece of wood. If the bottom blotched badly I know the top most likely will too. I can then adjust my application method before applying the finish to the show side. Staining the bottom also give me an opportunity to see what the color will look like on a larger scale, to be sure I like the final color. This is especially helpful if you have a customer or spouse that has a hard time visualizing what the entire piece will look like from a little stain sample. It is much easier to strip the finish off the bottom to try a different color opposed to the whole piece. Having the blank canvas on the bottom also allows me a risk free area to practice a new application technique. When I first started using water based gel stains, I found the application method I typically used for oil based stains left streaks and overlap marks. The water base finish dried much faster than an oil finish. Without using the right application technique, I found the water based stain would dry before I had a chance to come back and wipe up the excess, leaving overlap marks. That is something I would have never discovered on a small test board, and would have been devastating to discover when staining the show side of the tabletop. 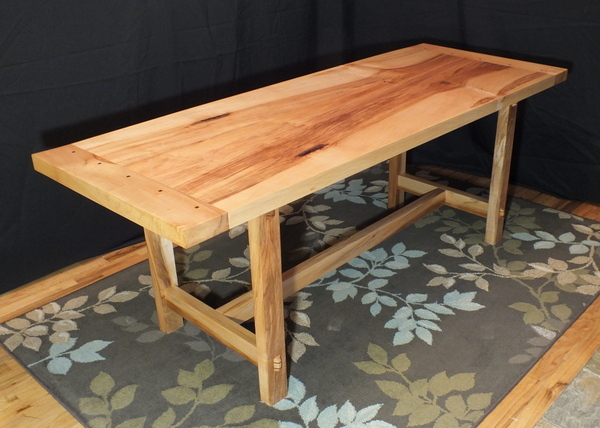 However, practicing my application technique has saved me from many tabletop do overs; it is not the main reason for finishing the underside of a table. When I build any piece of furniture, I want people to be drawn to it. I want them to reach out and feel how smooth the finish is by running their hand across the top. I think we both would be disappointed, if as there hand glides across the smooth top, wrapping around to the underside of the table, only to discover a rough unfinished piece of wood. When someone buys custom furniture, I believe part of what they are paying for is for the craftsman to pay attention to the details. I think finishing the underside of a table adds a nice detail. Celebrating Earth Day with Some Environmentally Friendly Finishing Tips! Most of the finest antiques, (that’s particularly 18th century Philadelphia Chippendale where I am from) left unseen surfaces very rough (often extremely so) and usually without any finish. I don’t know, that always seemed to me to be part of the charm of these masterpieces. Regarding stability, these pieces have stood the test of time pretty well. The Village Carpenter Winner of our 2014 Lie-Nielsen/Tormek Sweepstakes Revealed!